Now Is The Time To Be Invested! If you have ever gone to an auction, you know that the greater number of bidders for a small number of items usually results in higher prices. The stock market is really this simple. Stocks are a commodity just like any other and what we lose track of is that there are a finite number of stocks available for sale. Every time there is a merger or a takeover of a company, millions of shares are removed from the auction table. Over the last two years Carl and I have been writing articles and giving seminars on being invested, on being diversified with investments, and on being patient with your portfolio. 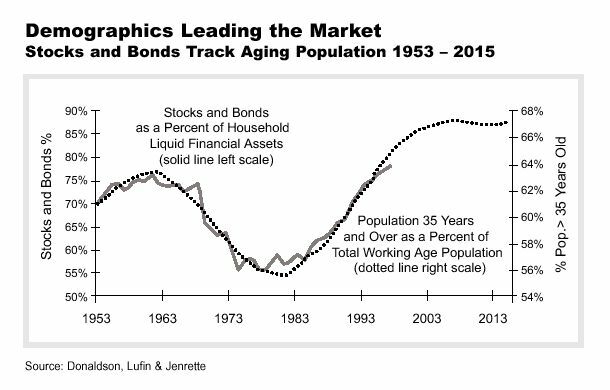 One of the underlying fundamentals that we have harped on during this period is the historical relationship between stock market price increases and population bulges of people over 50 years of age. During the last two years, we have begun to witness the largest group of 50-year-old people ever to be exposed to the stock market. Certain sectors of the market have exploded (as in high tech), while others have languished (such as old economy stocks). Merger and takeover activity have also exploded and as mentioned above, millions of shares once available are now gone. It is very difficult to stand back and get an overview as to markets and opportunity. What is the next sector that will move higher? Which global market will be the next to run up and what of energy prices, inflation and interest rates? In my 17 years in the business, I have never seen a period of time where positives are not balanced with negatives and fears, such as at this current moment in time. Yet, when we look at the economic basic of supply and demand, we have a supply of stock disappearing from merger/takeover activity while there is a growing demand for performing investments from the baby-boom, over 50 group. In 1999, the US market delivered great returns, but so far in 2000 it has lost money as these gains were digested. Both the Dow and S&P 500 look ready for a rally. Oil and energy prices have increased dramatically, yet the energy sector stocks have yet to reflect these higher prices. Base metal commodity prices also look poised for a rally and, as Canada is a global resource market, we would expect a fund like Fidelity Focus Natural Resources Fund to do well. Remember, diversification and patience are a must! Many of our clients own AIC Advantage Fund and many were disappointed over the last three years as the fund languished along with the financial services index. Many people were also getting tired of hearing us say, "hold on and be patient". We are pleased to report since February of this year the fund is up 38% as bank and mutual funds company shares have jumped. Being bullish on Canada, in February 2000 we also recommended two new funds to our clients, Synergy Canadian Style Management Class and Synergy Canadian Momentum Class Fund, and are pleased to report that they are up 29% and 28%, respectively. Last year, Labour Sponsored Investment Fund prices were very high during RRSP season. Why not make your LSIF purchase early this year? By making your contribution early, you can take advantage of a longer period for potential growth. reiterate the axiom of a diversified portfolio. Therefore, when performance shifts from one investment to another, the adverse effects of a downward turn are minimized through a well diversified portfolio across different asset classes and marketplaces. The important thing is to be diversified, to stay invested and be patient! If you are interested in participating, or if you would like to see if your company is eligible to participate in our plan, please call our offices or contact your human resource administrator so that we can look at setting your company up with a Group RRSP plan. Visit www.scotiagroupplans.com/group_plans for more information. AGF Management is buying Global Strategy for $438 million. The combined company will have $35 billion in assets under management. Closing is expected for October 31st. Mackenzie has announced two pending fund mergers. Subject to approval Mackenzie intends to merge the Industrial American Fund and Universal US Blue Chip Fund. Both funds are run by Paul Baran, who took over Industrial American in July. The Industrial Mortgage Securities Fund is also to be merged into the Industrial Yield Advantage Fund and will be renamed Mackenzie Yield Advantage Fund. Sentinel Global Fund will also be merged into Universal International Stock Fund.